Stretch enhancers, eQTL, chromatinQTL, and GWAS. Our paper titled "Cell specificity of human regulatory annotations and their genetic effects on gene expression" is now accepeted in Genetics! Thanks to Arushi for leading us through this project! 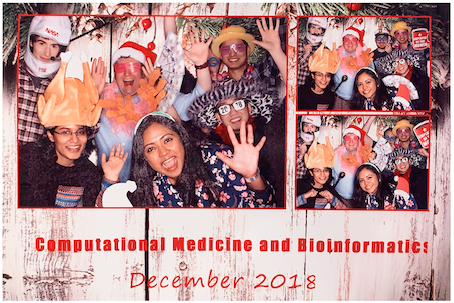 Happy Holidays from the Parker lab! FUSION 2018 in Ann Arbor! Exciting developments at 2-day FUSION conference, an international collaboration between investigators across five institutions to study diabetes. Parker and Bielas labs awarded Precision Health Initiative grant! The Parker and Bielas labs have teamed up and were awarded a Precision Health Initiative grant titled "Genetic modulators of opioid exposure in human neurologic development." Congrats to the team! YAMDA, a GPU accelerated motif discovery algorithm developed by postdoctoral fellow Daniel Quang is now published in Bioinformatics. Ricardo's submission was selected for a talk at Biology of Genomes 2018! Peter Orchard will remain a trainee on the NHGRI-funding Genome Sciences Training Program, a training grant for PhD students and postdocs.